Features a large 8 oz EZ Kleen stainless steel kettle, twin arm kettle suspension, and removable kettle, as well as a heated corn deck. Comes with crumb tray. 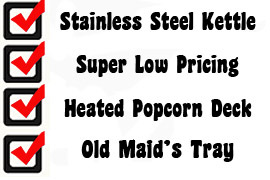 The Gold Medal 8oz Fun Pop popcorn popper will do very well in small to medium operations. It's a great money maker church and school functions.